This is a true security chain, made from square, case-hardened links to resist cutting. Laclede recently changed their heat treating process to make this chain 62-65 HRC. Made from quenched and tempered alloy steel with an electro-galvanized finish for corrosion protection. 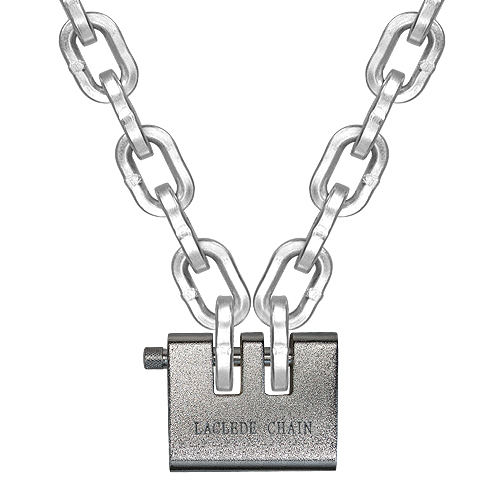 Laclede calls it "Lockdown Chain" for a good reason, and at 3/8" (10mm) in diameter, this chain is considered by many to be the ideal size. What is the outside diameter of the chain links? I need to see if it will fit through the holes in my trailer rims. For the 10mm (3/8") the outside dimensions of each link measure 2.29"L x 1.47"W. Due to the nature of how chain is manufactured, there may be some variation from one batch of chain to the next. 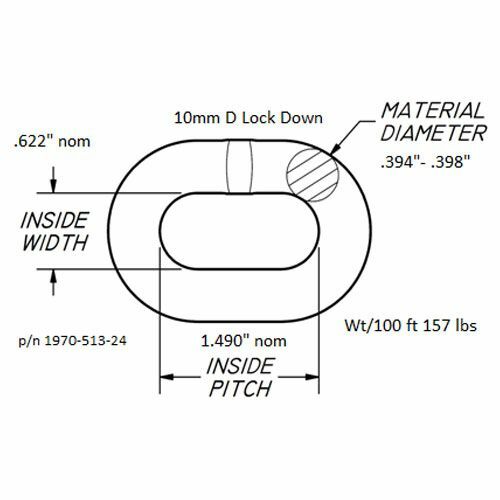 For the 13mm (1/2") the outside dimensions of each link measure 2.80"L x 1.90"W.